I have to say what you do is truly amazing. I hope you are often told that. The photographs from her surgery gave me cold chills. Thank you for knowing what to do for her. The way you removed the tissue around the tumor blew me away. The talent, skill, knowledge, and compassion you have for what you do is not common. Thank you for what you have done for Kat. Regardless of the outcome I know she has gotten the best possible care she could have gotten anywhere. Don't get me wrong - I pray we beat this thing! I have hope that there is a chance we can but I also understand how aggressive this thing is. If it does comes back I do not doubt for one second about the care she has received. I know you have given her your best and that means so much. Thank you for what you do on a daily basis. I cannot express that enough. Fox Run Equine Center has been wonderful and very supportive though the whole process of the removal of a large sarcoid on my mares leg. They have been upfront, honest, and very caring. They let me know exactly what was going on and when it was going to happen and what to expect afterwards. There is no greater comfort than to know your horse is in good hands when you have to leave them. 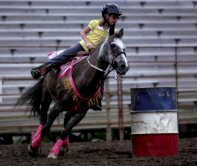 I would recommend Fox Run Equine Center to anyone. After trying numerous times to treat my mares leg with another vet with no success it is nice to finally have hope. Thank you Fox Run staff and Dr.Burks for what you do! I want to thank you Dr Burks and all your staff for finding out what was wrong with star and taking such good care of her when she was sick. When my vet at home could not figure out why she kept running a fever and had no energy even after treatment, he recommended we take her to a vet hospital. I had no doubt in my mind where i wanted to take her and i am so grateful for the outcome. It was a long road for her but through it all you and your staff kept me up to date which helped me more than you will ever know. She is doing well and i look forward to riding her again in the spring. Thank you again for your excellent care and patience. God bless. through overnight. She is eating, drinking and no signs of distress. returning my calls so promptly and helping us through our issues. I remember it well, as we all do when something happens traumatic in our lives; it was Thursday in February, 2010 when I opened Abby's (half Friesian & TWH) stall and found her front leg at the ankle swollen, she had been out in the deep snow for a few hours that day and I thought she must have banged it up a little, but she was just under a year old, and the love of my life, so I called Dr. Burks and within 30 minutes he and his team were here and taking radiograghs (x-rays) and found a fracture in her fetlock, along with a damaged ligament. It was decided to bandage the leg and try and reduce swelling, then operate on her the following day ......OPERATE...... yea operate; you know how that terrifies us horse owners with just the word, so the next morning I loaded her up in the horse trailer with wall to wall carpeting in it so she could not slide at all and 6 inch padding on the slant load panels so she could not tilt, in other words she was packed in there like a sardine. With my heart in my throat, we drove her over and unloaded her. The team of experts was there when I got there and started an IV and blood work and then they took her back.........yea to OPERATE. The longest hours in the world is when you're outside the operating room and they are inside, but we had no choice; it was this or lose her, and I could not even think of that! Even if she would remain lame I thought that would be ok, as she was a mare with good breeding and could be used as a broodmare. They were great at coming out with updates and putting up with me asking a million "What ifs".... It was a long process of hard cast and soft cast, but today I have a beautiful and SOUND Abby that someday soon will be pulling a carriage. What I have not mentioned here yet is that it was evening, after regular hours when I found her like that and Dr. Burks still came..... that means something to me. I have called that poor Doctor as late as 11:00 at night and he came and saved Bonnie Bell, one of my best carriage horses life; she had a fever over 104 and breathing badly. What I find important to me in my choice of Doctors, is one that cares for the animals and is knowledgeable, but that don't mean a darn if when you need them you cannot get them and unfortunately animals do not get hurt or sick only Monday through Friday from 9-5. We usually notice these things when we bring them in at night after 5:00 pm and most veterinarians are home eating supper..... Dr Burks' clinic is also one of the few places where your horse can have surgery. Thanks to Dr. Burks and his team I still have my horses, home safe and sound. Doris, Abby, Bonnie and all the rest. Thanks for helping to keep Boogie Boy healthy & happy with your great knowledge and care. He is not just "27+ & going strong" but competitive at a high level. Who thought he would still be able to win High Point Awards? An extra special thank you to Dr. Brian Burks and his expert staff at Fox Run Equine Center for giving me my sound horse back ! Sportin Time, a.k.a. 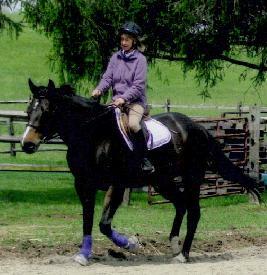 "Sporty", arrived at Fox Run in May 2007 with severe lameness of his left front leg. 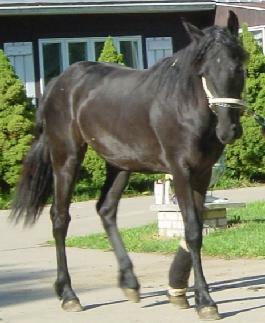 He was diagnosed with a ligament tear in his pastern along with a significant reduction in blood flow to both front legs. Sporty remained at Fox Run for a week of IV therapy plus other medical treatments. After coming home, Sporty returned to Fox Run once or twice a month for several more months for evaluation, ultrasounding, joint injections and to receive shock wave therapy to the torn ligament. He was such a good boy through it all. Thanks to their expert knowledge, treatment and technologically advanced equipment, our last visit to Fox Run on March 11, 2008 showed Sporty to be sound and the ligament well healed. He finally had his easygoing, suspended trot back. Thank you, Fox Run Equine Center, for all your state of the art equipment. And a special thank you to Dr. Brian for all your care, concern, expertise and guidance during Sporty's road to recovery. Thanks to the Doctors and professional staff at Fox Run Equine Center. I feel like you all truly love what you do! Every time I come in to see you, both me and my horse have had such a pleasant experience. Everyone is so friendly and knowledgeable--I'm really impressed! Thanks Dr. Burks for your loving and professional care for our newest family member! 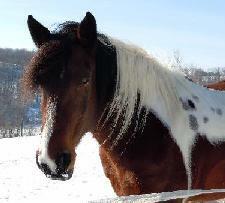 We appreciate you and your staffs' genuine concern for all our horse for the past 10 years. 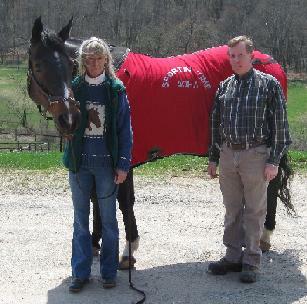 We have always felt like we have been treated as part of the Fox Run Equine Center's family. Its so reassuring to know that we don't have to worry when we leave our horse for medical treatment. Thank you so much! I think the world of Dr. Burks. Not only does the doctor and team at Fox Run Equine Center provide the best veterinary care possible, but also unmatched personal service and of course lots of love! 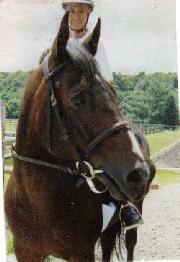 I trust you with my most precious possessions...and refer all my friends and family to Fox Run Equine Center. The care you gave was excellent. Thanks again for coming all the way out to evaluate her. I can tell you really care about the animals. I know Star could be frustrating at times, (especially with the trailer loading as we all found out) Its good to know that you are there to help us if need be.